Life stories – produced by award-winning filmmakers. Films about your family – for your family. Heirloom Films produces high-quality documentaries about your loved ones. Using interviews, photos and music we create a treasure for you and generations to come. Celebrate the legacy of a special family member with the power of film. Capture vivid and lasting memories of your parent or grandparent. Keep stories alive for generations to come with beautifully-produced vision and sound. For me the film is a priceless gift from my Mum, one I will never tire of, one that makes me cry, makes me smile, makes me proud, but most of all, it lets me know how much my Mum loved me. Thank you for giving Mum a most amazing experience and thank you for giving me a lasting memory, an Heirloom. Thank you for the lovely film record of Dad recounting the story of his life. You captured the essence of the dad I know and the dad I didn’t know. He enjoyed the experience and we all will always treasure the result. Heirloom Films provides a unique way to record and share our elders’ precious stories. It also offers a special experience for elders to sit on the other side of the silver screen. "So moving, genuine and just wonderful." "She is inspirational and you have captured that." "The impact the film had on me was very powerful." 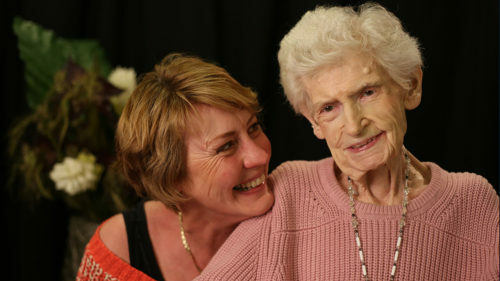 Want to create a film about your parent, grandparent or another loved one?